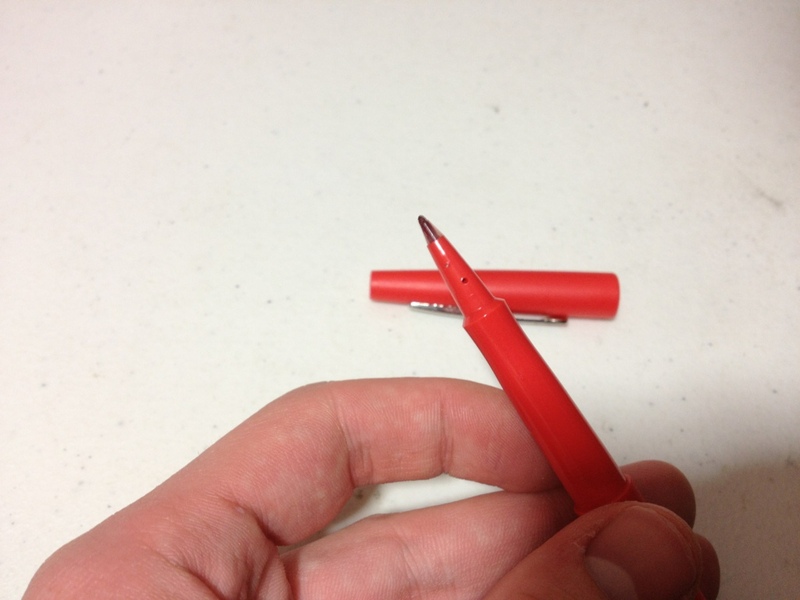 A while back I reviewed the Papermate Flair pen, and I was going to say that this was a review of the red version of the same pen; but really I intend this as a continuation of the last review after some more use, and as a review of the red color for the pen. I can confirm that the inner cap will keep the tip dry for extended periods of time. The clip is very difficult to use and is easy to get bent out of shape. And while the black pen has a problem with the color rubbing off, the red has no such problem. The red color itself is more of a pinkish, and it’s kinda washed out. The line for the medium is spread out enough that it is very noticeable as a not-quite red. It isn’t very aggressive, so if one was grading papers and such and wanting to use something that didn’t offend the viewer, this would work. However, as far as I can see there are no other practical applications. Perhaps marking on technical drawings, but again there are easier and better solutions. Using the pen on a very absorbent paper will make a much deeper color, so that is an option. Overall the Flair is still a great pen, but I wouldn’t recommend the red color as it is not a very strong red, or a good covering color. This entry was posted in Intermediate Supplies, Utensils and tagged felt tip, felt tip pen, flair, papermate, part 2, pen, red, review by Dragon Co (Austin Smith). Bookmark the permalink.